« Merry Christmas 2014 !! On one of the discussion groups, I recently observed a new, freshly registered colleague, asking questions. I read his very first post with great interest (post number “00001″). Within this post he mentions that he is in the process of building his very first DIY project. He posts very reasonable question – as above. Frankly, the questions actually do have a second bottom to them, because they relate to something much deeper, to the very basics, or to a methodology, or even philosophy and discipline, of how one needs to approach any DIY development project. Essential and very important, all very good questions, concerning in general the Strategy for Success. Not all discussion forums welcome warm-heartedly newly registered users, or beginners. Not in Poland at least. Such newbies do not receive much attention or consideration, and do not easily obtain answers of added value. So I see this freshman, sitting there and waiting for mercy, so that someone invests in him his own private time, provides some advice and help. His “amplifier problem” related to simple and nice amplifier circuit, as above. Ok, so I took stance, came forward with a sudden, irresistible desire to share with him some of my experiences. Perhaps apt, perhaps not quite, but at least existing experience from some of my past DIY creations. Sitting for a while in the electronics and do-it-yourself sandbox, I actually have some established views, some kind of philosophy, procedure, or “prescription” on how to proceed with this type of hobby and with such DIY projects. At the very outset, I have noticed that right next to the schematics diagram, the freshman has posted a photograph of a a contraption, which in essence constituted a fully soldered together, fully assembled and “ready” module, on a piece of lab PCB. Turn it on and observe if there is any smoke rising out of it, waiting for the big bang. So I decided to lend a helping hand. Actually used the occasion to nag him a bit, while I was at it. My reply was similar to the following. Dear Freshman, do you want the answers presented to you “sympathetically”, or rather “honestly”? I have successfully conducted and completed a couple of major explosions in my DIY electronics past, I have seen circuits fry, literally catch fire. All these exciting and spectacular occurrences have taught me a little bit of humility and humbleness. Humility is essential. Especially in the beginning, Modesty and humility are the necessary prerequisite and the premise a favorable success of your DIY project. Interestingly, this “humility” thing … it is something completely alien and incomprehensible to the novice DIY enthusiast. He, who throws himself the depths and swirls of deep water DIY with an enthusiasm similar to that of a young shark, swallowing donuts. Kelly’s Heroes seems to be his motto and role model … Go for the Gold? Well, yes, gold, or a small fortune, is the price thou shallt pay, in the form of needlessly and pointlessly burned, blown components. Components which are sometimes painfully expensive. But lets go slow on this. At the very outset – a simple question: Do you, Dear DIY Freshman, have access to a multimeter? For starters, it is sufficient even to go with a very simple one, the kind that you purchase for the price of peanuts on some internet auctioning service. I will say this: Dear Freshman ! As a man full of humility (and mind you, I was not alwayS like that) I would try to approach your “Hedgehog” DIY project in the following manner. First and foremost: If you have any op-amp inserted into that socket of yours – REMOVE IT ! The actual Op-amp – this electronic component you shall add at the very very end of the process, when you are confident that all the other elements within the circuit, the “environment” adjacent to the op-amp is properly configured and ready for its “arrival”. Operational amplifiers, are sometimes quite costly, especially those of a better quality, so you do not want to inadvertently and needlessly fry it from the very outset. 2: Always start from the “back side”, being the power supply. 3: I always create my circuits by adding very small increments, adding a small number of components – the minimum possible amount, the smallest possible functional unit, the smallest logical “block” or module. In fact so small that it is the smallest meaningful unit that can be distinguished. After the addition of such a small increment, after such an incremental “Process Step” – immediately call, like in a Poker game: “Check !!!”. Each and every time that I add such a small increment to the circuit, I instantaneously test this small little increment. One single component, or maybe perhaps two, three or at most four newly added, soldered components. I connect such a work in progress to to the power supply and check if the new additiona are operating properly. a). Start assembly by mounting upon the circuit board a single component: the transformer. Check and make sure that you are soldering it in with the “high-voltage winding” facing in the direction of the mains wall socket, and not vice versa. Wear safety glasses. Yes, protective. Connect the contraption to the safe extension cord (the one discussed previously) for something like 3 seconds. If you see smoke and melting plastic, then yes, this is an abnormal situation. Disconnect the contraption, verify that you did not confuse the primary winding with the secondary winding, then take the next (unburnt ./ unmelted) transformer – and try again. b). If nothing smokes and nothing melts, then reconnect the unit to the power supply. Take your multimeter and set it for a probing range of say 200V AC. Then check what voltage you have on the SECONDARY winding of the transformer. If there is something in the neighborhood of 9V AC to 10 V AC – that’s good. Do not worry if it’s a bit more than the transformer has written on its label. This is normal, because they normally publish it’s rated voltage whilst working under normal load conditions. You are measuring it now at “idle”, without load, so the voltage may well be a bit higher. c). If the AC voltage is reasonably right – Phew! – Your first little success. A critical part of the circuit, the high voltage side, you have already successfully behind you, finished and closed, and all under control. Now in the next steps you shall be fiddling in the safer parts of the circuit, in the Low Voltage domain. This is the moment where you should go to the refrigerator and get a can of good beer, or go fetch a bottle of good wine. Yes. Dear Freshman, It is time to celebrate. Celebrate your first small step. Your first little success. As the Chinese proverbial saying goes, … Even the longest journey always begins with the first small step. d). Now, add / mount the diodes D1 – D4 and capacitors C9 and C10. Make sure that you have them soldered with the right directions and polarities. The pluses to the pluses and the minuses to the minuses. Pay attention to the polarity. Reverse polarity will destroy the electrolytic capacitors. They may even explode. Wear safety glasses. Serious. Turn on the power. Set the multimeter for the 20V DC (Rectified Voltage!) range. Each of the capacitors should have upon its terminals something like a square root of two times higher a DC voltage than the AC voltage from the secondary winding, as the one you have measured in step b). e ‘). Add another batch of components from the schematic: the LED resistor R13 (prim) and the LED (prim). If the LED during testing does not light up, then remove it, turn it around (polarity) and try again, because it might be “upside down”. Attach the power and check that it lights up correctly. If not – that would mean that the LED is blown. You burned it, as some leds have a very low breakdown voltage in their “reverse”. Even that mere dozen volts or so, from the power supply could damage it, if connected in reverse. Take another fresh LED from the box and mount it into the circuit, but this time – mind the correct polarity. e ‘). Add the “non-existing” elements of the schematic: the resistor R13 bis and the LED bis. Non-existing? Indeed, Yes. You shall now implement your first improvement to this existing schematic. You intend to enhance it by an additional signaling LED, on which shall tell you that also the “negative” power rail works correctly. It is sometimes convenient to have a visual confirmation that some important functional blocks for your DIY project are working properly. This time you shall be soldering the components “symmetrically”, but “vice versa” – the LED will now be with reverse polarity, because this time it shall be directed “towards” the negative rail (conduction mode). If the LED does not light up during the test it is probably because it is of wrong polarity. Correct the problem so that both of the LED’s signal the proper rail voltage as “available”. The point e ‘). is optional. I just wanted to highlight a certain issue there. Even within such a small project, there are times wher you can creatively add something on top of the existing schematic, something of “your own”. But a small caveat here: you need to know what you are doing. If you are not sure, it is better not to fool around. Introduce changes to the schamatic only if you are confident of what you are doing. If at all, introduce them in very small increments. f). Add the capacitors C5-C8. Add C11-C13. Add R11-R12. Check out by means of two series-connected automotive front driver’s panel filament light bulbs (the low power types, used to light up the drivers dashboard). Create a series connected pair, a “complex” bulb, as in: 12V + 12V = 24V, Check that the voltage +U1 shines just as intense as the -U1 voltage. Then check that the voltage +U2 shines much less intensely than +U1, and that -U2 shines much less intensely than -U1, while both of the voltages: -U2 and +U2, shine with identical intensity (although both much less intense than +U1) . g). In step as above, I just wanted to point out to you that you can test systems in many a different way … and sometimes in very unusual and/or simple and/or bizarre ways. h). Add the T1, R5 and R4. The voltage at the junction of these elements should be undefined, because there is no modulation at the base of the transistor at this very moment (because there is nothing else connected to that base! ). i). Add a temporary wire originating from the LED resistor R13, the one from the positive branch, which has a current limited positive voltage on it. Route it from the tip of the LED to the base of transistor T1. Try to confirm that the transistor now conducts heavily – the voltage at the junction as in h). should now be of a significantly positive value. j). Optional: add a temporary wire originating from the (non-existent) LED current limiting resistor R13 bis – the one in the negative branch you optionally added in e). Route it to the base of the transistor and try to confirm that now the transistor is totally blocked and does not conduct at all. The voltage at the junction as in h). should now be substantially negative. k). After these tests – you can assume that the transistor T1 is working properly. l). Mount all the other passive components of the left channel, the ones constituting a group of a “single logical functional Unit”. Before placing the op-amp to the stand – double check its “orientation”, if by accident you are put it in rotated by 180 degrees. The action of inserting the very final component – the op-amp into it’s socket – requires additional commentary. Inserting the op-amp is equivalent to “closing the negative feedback loop” within this module. This “closure” occurs through resistor R3 (and, respectively, R8). 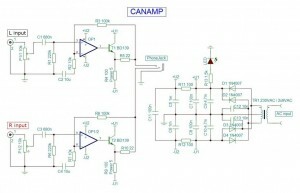 Dear DIY’er, remember that the whole philosophy of the op-amp, as a functional block, is that it will do absolutely ANYTHING so as to keep the voltage at it’s input legs: “2″ and “3″ at exactly the same voltage, ie with a ZERO difference between them.. With that in mind, you can now quite easily “reverse engineer” the workings of the circuit quite easily. On the op-amp leg “3″ you MUST have have a voltage of zero volts. Thus Spoke Zarathustra (or, rather, the resistor R1). This implies that the op-amp leg number “2″ must also be bearing zero volts. The capacitor C2 block any and all DC current. “Nothing” (in terms of DC ! )will flow through it. And since there is no DC current flowing through C2 and R3, both sides of the resistor R3 have the same voltage upon them. There is simply is no “other alternative path” for the current to flow through (*). This is why the output of the amplifier “MUST” also be at zero volts DC. m). Before connecting the headphones, check the voltage at the emitter of the transistor for each of the channels L and P. Make sure that the voltage at these points is close to 0V. “Close” here means nearly, i.e. an acceptable level of deviation at a level of individual millivolts. n). Provide an input signal to the input of the system. Connect the headphones, and tell me if you hear anything. The system should be alive and kicking. If it is not, then maybe you have a faulty / blown op-amp in the socket? 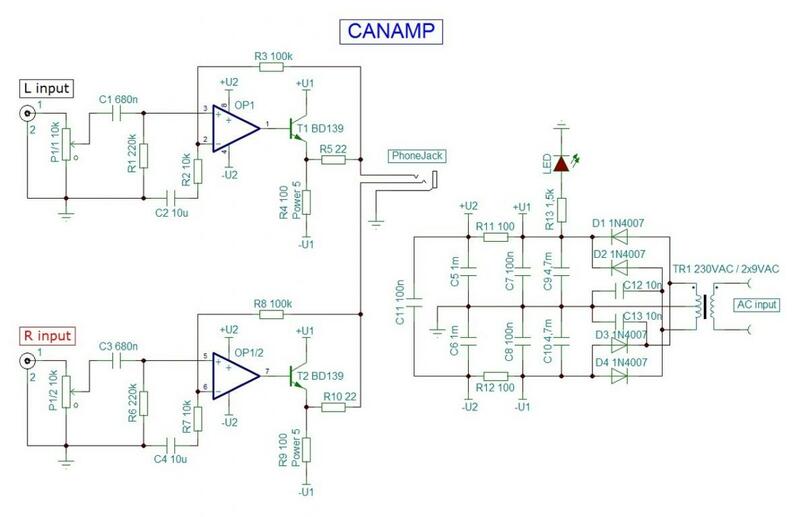 Try another pin-compatible op-amp. o). Now try the workings of the potentiometer. If it regulates the volume “unevenly” then either it is a linear attenuator (and you should have purchased a logarithmic one ! ), or it is indeed logarithmic, but you have mixed up the side taps. Exchange the side taps and the input wire with the ground wire on the pot. The side terminals of a “logarithmic” potentiometer are not interchangeable and each has it’s distinct function and meaning, the extreme ends of a logarithmic pot are not “equal”. p). If you have not heard any sound from your installation by now -search for wiring errors in the recently added function block. q). If you hear the sound correctly, with a proper and undistorted response accross all possible levels of the attenuator / volume positions, then just assemble in a similar fashion all the components of the right stereo channel, repeating the whole procedure from h). to q). y). Start listening to your music and enjoy. Whilst doing so – think about some neat chassis to house your latest creation. NEVER, EVER conduct such a project by soldering in “wholesale” all of the components into the PCB board. Take it in small steps. This way, you shall actually achieve a positive result much, much faster. A lot less frustration. An incremental, methodical approach provides you with an almost guaranteed success. The “wholesale” is a little rebellious and reckless, and bound to lead to trouble. Especially in the case of a “Beginner”. You simply *** MUST *** succeed in this first project. There is no other option. Otherwise, any potential initial failure shall imprint a flaw on your Ego, on your Electronic Psyche – and worse – it shall linger as an electronics trauma and as a splinter within your head for the rest of your electronic life. You MUST complete this project successfully. So do it humbly and in an organized, small-steps manner. An old Chinese proverb held that even the longest journey always begins with the first small step. Get enough sleep. Continue onwards the next day, with a fresh mind and fresh eyesight / insight. Approach the challenge afresh again. Now that you got the circuit operational, take a piece of fairly thick, solid core wire and solder it on top of those ground routing tracks of your PCB. The gauge of the analog ground wire is “never too thick”. The main CLEAN GROUND POINT of your circuit is located between the capacitors C5 and C6. The main DIRTY GROUND POINT of your circuit is located between C9 and C10. The Screen (“outer sleeve”) of each of the input RCA plug coax interconnect cables should be connected directly (resembling a “star”) with a single, separate, thick wire to the Clean Ground Point. The Screen (“outer sleeve”) of each of the headphone jack coax interconnect cables should be connected directly (resembling a “star”) with a single, separate, thick wire to the Dirty Ground Point. Have a nice listening experience. But wait a minute … Is the Clean Ground Point not the same thing as the Dirty Ground Point ? Well, not all is what it seems. Dear Freshman, if you think that the “voltage” level at the Clean Ground Point is the “same” voltage, as the voltage in the Dirty Ground Point …. hmmmm … .. There are WONDERS in the The Heavens and on Earth, of which your philosophers have not even dreamed of (Juliusz Słowacki, a Polish Poet). And believe me, the voltages at these two points are NOT equal. I assure you that they are not, although NO multimeter on the face of this planet is good enough to “see” the difference and document it. On the other hand, the optional and irritating hum in your earphones, which may come to exist if you have cable routing issues, may provide “living proof”, that there is merit to what I am talking about here. Oh, one more very important issue, or principle. I mentioned earlier, that the DC voltage at the output of the amplifier is theoretically was zero volts. So, carefully check the voltmeter and the value of the DC offset voltage at the output of the amplifier, before connecting your expensive and valuable headphones. Gradually turn your voltage meter down on the lower ranges Indeed, you shall and will observe a small imperfection. A small offset voltage, be it single millivolts of voltage deviation from zero volts with respect to the (dirty) ground – this does not constitute a problem. But if the deviation is significant, for example. Tens of millivolts, or horror of horrors several hundred millivolts, then your headphones will certainly not be happy about this fact. I keep my fingers crossed for your success at your the first DIY Beginner’s project.